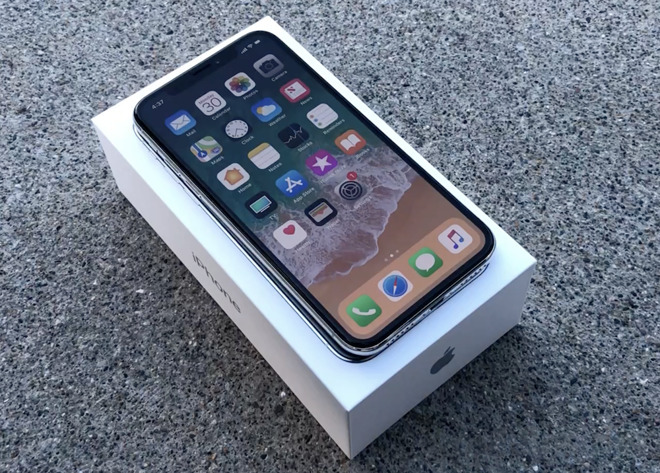 iPhone X is effectively an iPhone 8 with an edge-to-edge OLED display the takes over the entire face, shedding the iconic Home button and replacing its Touch ID with Face ID, a biometric authentication system that feels fast and fluid. It does however, require some significant adjustments. Fortunately, the revamped gestures Apple has lined up to facilitate the removal of the Home button are smart, intuitive and open up new capabilities. The worst part of the unboxing is that iPhone X still only ships with an inadequate 5-watt USB charger, even though the new phone supports Qi wireless charging and USB-PD Fast Charging. Actually using either one requires some additional purchases. Setup is simple, thanks to iOS 11's Quick Start process that sets up your new iPhone using your existing phone and iCloud setup. iPhone X adds a new step for configuring Face ID, which involves effectively taking a selfie where you briefly roll your head in a circle twice. That's enough for Face ID to subsequently recognize you, using an adaptive algorithm that shifts as your appearance changes. If you make more radical changes--shaving off a beard, for example — you typically only need to reenter your passcode to confirm that you are still you. 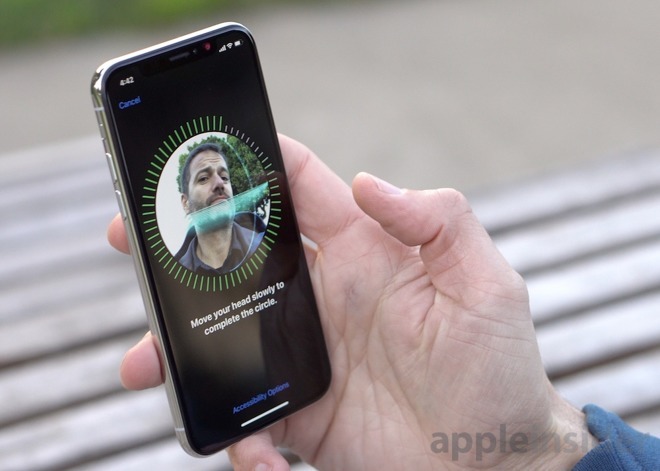 One potential disadvantage over Touch ID is that you can't share a device (some couples apparently configure a shared device using each of their fingerprints); Face ID is designed to work with one person. One advantage Face ID has over Touch ID is that it's now easier to wake without automatically jumping to the home screen. On iPhone X, you can now wake with a touch on the display, or simply raise the device. This turns the screen on and shows you your notifications. It then starts looking for your face. If you point the phone at somebody else, you get a vibration and a shaking lock animation that indicates you have racked up a failed ID. After too many false tries, Face ID requires you to enter your passcode. If it sees you, it immediately unlocks but you remain on the notification screen. By default, unlocking reveals the contents of notifications, a slick privacy improvement. Face ID consistently worked even without being pointed conspicuously at my face. Laying on a desk, it can generally see you from the side. No need to gaze into the device and wait for recognition. It's really fast. Raise to wake, and you can immediately swipe up to get to the home screen. With competing phones in both hands, I found Touch ID to be essentially identical in speed with Face ID. There is no hesitation period of unlocking. It just happens. Swipe up quick in any app to jump back to the home screen. Swipe up and hold and you get a carousel of apps to switch between. An even faster way to swipe between apps is also now possible from the bar at the bottom of the screen. Simply swipe left or right along this bar to slide in the next or previous app. It's really fast. The process for Apple Pay or in app authentication (such as making a purchase in the App Store) is similarly quick. To pay, you double tap the side button, similar to Apple Watch. It pops up a detail panel with a quick animation that indicates you've approved the transaction. In apps, you're similarly prompted to double tap the side button. For Siri, you can say, "Hey Siri," or press and hold the side button. For a screenshot, you press the side button with the volume up button. The screenshot appears in the bottom corner and you can crop or mark it up before saving it to your camera roll. Press and hold those buttons and you instead get sliders to shut down the phone, make an SOS call or show medical ID. The magic of Face ID happens via the dot projector and IR illuminator that take a depth map of your face along with a photo, and use these to analyze your characteristic facial structure in 3D. 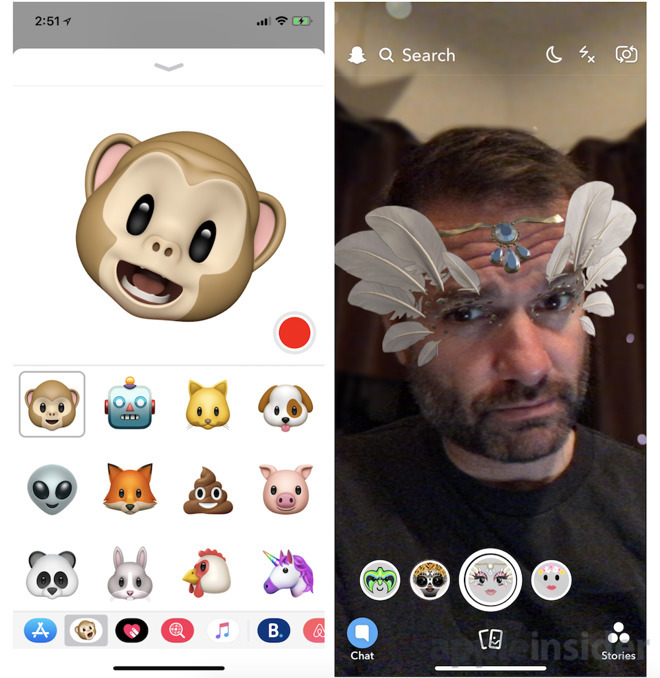 That same system also supports Portrait Selfies with Portrait Lighting, and enables iMessage to capture your face and use it to animate an emoji, either to create a sticker you can use in Messages, or to film a video clip (with audio) that animates one of a dozen emojis. This is super fun. Developers can also access TrueDepth to bring that functionality into their own apps, as well as using it for front-facing augmented reality. Snapchat provided a demonstration version of its app making use of TrueDepth to realistically animate filters on you face. Another part of the magic is the super advanced A11 Bionic chip, with special neural net hardware that handles the task of recognizing and mapping your face so quickly. Like iPhone 8, the new model has a glass back and front — using a custom glass developed for Apple by Corning — sandwiching a strong stainless steel frame contributing to a substantial weightiness. The new phone looks great, in a polished stainless steel Silver or a Space Gray ringed with a darker matte finish stainless edge. Both insert the black TrueDepth sensor array into a notch in the display that makes for a distinctive top in portrait mode. iPhone X units I saw at Apple's facility appeared to have incredible viewing angles, very strong contrast ratios with deep blacks and vibrant colors that made my iPhone 8 look washed out and lifeless in comparison. However, the review unit I was issued appears to have a display flaw accompanied with issues that do not seem typical. We are continuing to look into the issue with Apple. Apart from that, the iPhone X display was so impressive that it was shocking to see how much better photos and videos look on the Super Retina OLED display — images taken with earlier iPhones and copied over gained new life and vibrancy. Taking photos with iPhone X next to an iPhone 8, it was also evident that the new display was far superior, in both bright outdoor sun and inside, particularly in the smoothness of 2x telephoto video taking advantage of the new optical image stabilization now on both rear lenses. 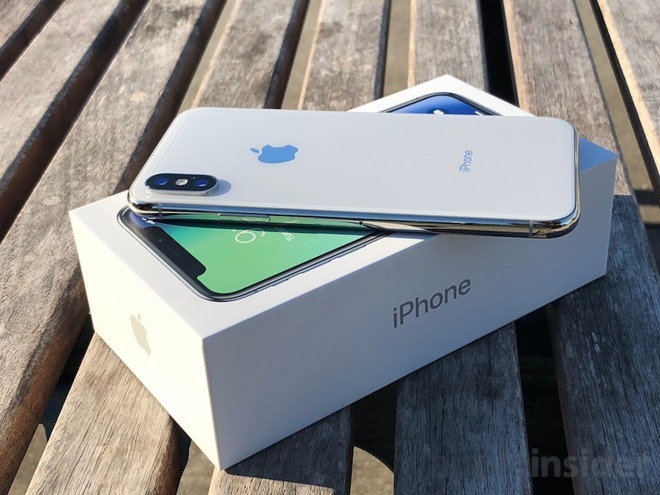 While totally rethinking the familiar design of earlier iPhone models, iPhone X also incorporates the features of iPhone 7 as well as this year's parallel iPhone 8.
iPhone 8's headline features are now "a month old," but also deserve mention as being new deliverables on iPhone X as well, including the new aluminum-ringed, strengthened glass case architecture that provides a distinctive appearance and enables the convenience of Qi "wireless" inductive charging with iP67 dust and liquid intrusion resistance; new USB-PD Fast Charging; compatibility with EVS high-quality voice calls over LTE; support for True Tone on its 3D Touch, HDR Wide Color Super Retina HD Display; the advanced A11 Bionic, which features a new 6 core CPU architecture that adaptively scales up for performance and back down to deliver energy efficiency for battery life, paired with Apple's custom GPU; larger, faster camera sensors with deeper pixels for better low light photos, paired with an incredible Slow Sync flash feature for better and more realistic scene illumination. 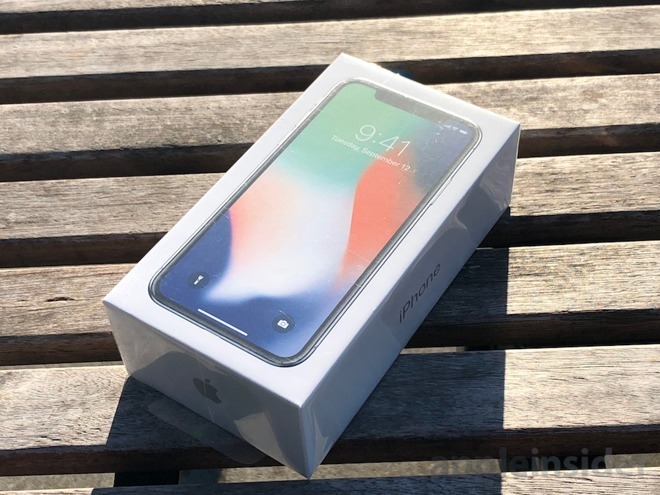 Stay tuned for AppleInsider's full review of iPhone X.